Infant Community, we propose a bilingual family environment for children / smaller as up to 2 years and a half where they feel physically and emotionally safe. 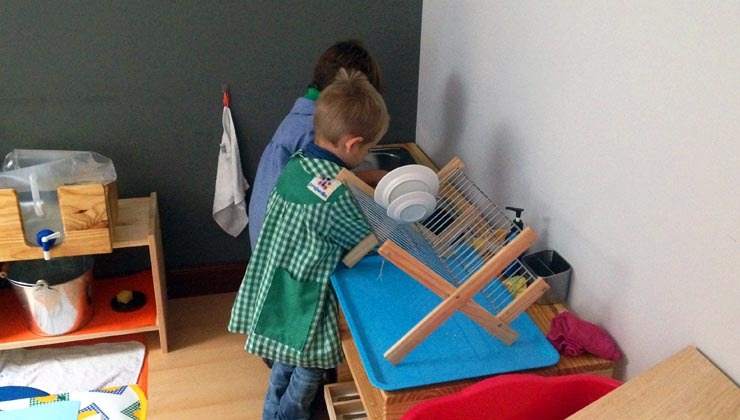 We propose a prepared environment Montessori AMI guides entitled (Association Montessori International); in teaching English and Castilian 50% partner. Environments equipped with all montessori materials for his age, and being all tailored to the child, arranged in a concrete and precise order, being designed to attract the interest of the child. Children / as of 0-6 years at a stage of formation that is characterized by a high absorption capacity subconsciously, what Maria Montessori called “absorbent mind”. This is the basis of creation of the individual. At this stage children spend their sensitive periods through sensory learning. The language, the order, the refinement of the senses and refinement of movement among others. An environment prepared to meet this need is paramount, because, at this age, the basis for further development are established. In environments Montessori autonomy and independence, self-esteem, willpower and self-control and self-discipline are encouraged. The work of refinement of movement, knowledge of the environment and all areas of the curriculum. Psychomotor, physical education, rhythm and songs are contemplated. Regarding the role of the adult, it is to guide the child as an individual based on respect and respond to their potential through a prepared environment. The link between children / as and adult allows them to accompany children in this environment from security. Bilingualism is present in the classroom through communication with the adult who lives in the classroom with the child. The child / a, is the center of this education. Through the work in the classroom the child / to build neural connections in your brain, and repeated experiences with the submitted materials and this helps the mental and physical self. Practical life is the first thing that enters upon his arrival in child community. They are attractive materials familiar to them as they have to do with everyday life. Help the child develop fine motor skills and coordination as well as help develop the ability to focus on a task for longer periods of time as a result, children become more independent which helps to develop self-confidence and therefore, self-esteem. The exercises of grace and courtesy help them learn to ask for things and interact with peers. Art exercises allow them to express themselves through painting with easel, watercolors, artistic expression with clay masses. Different jobs with different colors. Music exercises and body language; They sing songs, dance. We hear different music. Psychomotor exercises; working motor skills of children with suitable materials for it. Language. We attach great importance to language. The guides always make a great effort to use precise language and to constantly enrich the vocabulary of children. Each adult speaks in a language, in Castilian or English. Tales are told. It is observed and are guided to the acquisition of language, vocabulary, syntax and grammar. Presenting materials for this period. Each of the activities of these areas develop in children the ability to follow a logical sequence, this helps you to order, concentration and memory, foster care of his person and the environment and develop independence, security , self-esteem and respect for yourself and others.